I have enormous respect for Glenn Hughes. Who doesn't? His resume reads like a who's who of rock. Deep Purple, Black Sabbath, Tommy Iommi and a list that is too freakin' long to mention here. The 'voice of rock' indeed, or maybe so, by way of intense marketing. This guy is that good. 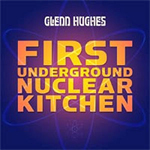 But honestly when I received 'First Underground Nuclear Kitchen (FuNk)' six months or more ago, I did not want to review it. Thanks to my new found association with Blistering Records, I've got to say something. Hughes has been exploring this whole funk/rock thing for a number of years now, and it does not connect with me. Sure, there are moments of revelation, transition, exploration and progression here, but Hughes has gone where no man (at least this man) has gone before. Mr. Hughes wants to be the voice of rock, blues, funk, and everything else in between. What he has become is an anomaly, the voice of post-modern nothingness. Hughes has become the voice of everything and nothing. I gave FuNK a new, and as unbiased as possible, listen the second time around. And yes, I found some good stuff on it. However, as much as he credits his new sobriety and calling on a 'higher power,' Glenn is treading the water of mediocrity here. When Mr. Hughes ventures back into melodic hard rock he blows his peers away. This is found on 'Satellite,' 'Never Say Never' and 'Too Late To The Save The World.' Otherwise, the only other good songs is where Glenn invites horns into the mix: check out the title track and also 'Love Communion. I think you can read my consternation into this review: I love Glenn Hughes. I simply do not enjoy his current direction. But, frankly, he does it well. If you consider his current musical loves and direction, this is the greatest thing that Hughes has ever delivered. If not, then you're like me; intrigued but disappointed. This is one major conundrum for fans!